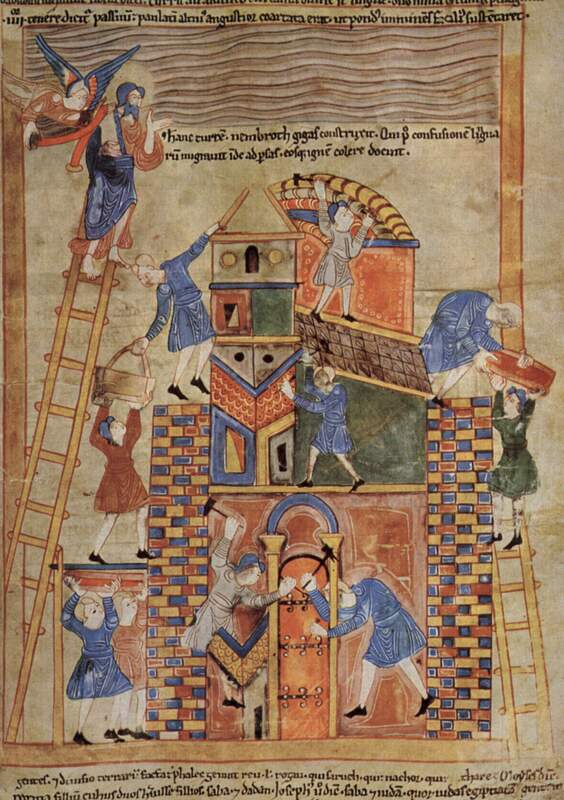 Babel in Old English Heptateuch (London, BL, Claudius B.iv, fol. 19r), courtesy of the British Library. In the June 8 issue of The New Yorker, a story appeared by Robyn Creswell (Assistant Professor of Comparative Literature, Yale) and Bernard Haykel (Professor of Near Eastern Studies, Princeton) about reading the poetry of Muslim extremists (known as ISIS) in order to understand them. The tagline of the article suggests, “Want to understand the jihadis? Read their poetry.” This claim, of course, seems intuitive: it is what many of us do when we study the past. Want to understand Judaism? Start with the Hebrew Bible. Christianity? The New Testament. Islam? The Qur’an. These are only the beginnings, however, as people who identify as followers of these religions have produced massive amounts of literature over the centuries, and continue to do so. Literature is good evidence for culture. Only a few days later, another discussion about literature appeared in the June issue of New Statesmen (guest-edited by author Neil Gaiman and artist-musician-author Amanda Palmer), a conversation between authors Neil Gaiman and Kazuo Ishiguro. In this conversation, Gaiman and Ishiguro discuss genre, canon, the ways stories are told, and a range of subjects related to reading and thinking about literature. They demonstrate how literature is entwined with culture. Literature of Medieval Britain (an upper-level course), which will be a grand survey from Bede to Mallory. Culture necessarily infuses each of these courses. In the Canon and Analysis courses, I plan in the first week to read and discuss the conversation between Gaiman and Ishiguro as a way to start thinking about literature, culture, and a whole host of ideas related to reading, writing, and analyzing. I’ve also been thinking about how we reflect our own culture onto our readings. Bias. Perspective. Identity. Theory. We all have our own agendas when reading and analyzing. We read, interpret, write, and analyze through different lenses. We use glasses of various tints. And, in many ways, using these glasses is often necessary, sometimes justified, and even honest to who we are. Part of academic work means reflecting on, acknowledging, and challenging our own personal assumptions and biases. Sometimes we (and our students) view bias as negative, although it’s not; it’s part of being. I’m skeptical that we ever can (or should) wholly discard our own biases and, in many ways, our identities, as we learn to analyze somewhat more objectively. I aim to address these issues as a key part of all of my teaching. A few weeks ago, after the Supreme Court’s decision to uphold marriage equality as a constitutional right across the United States, I received a message from my father-in-law, who wanted to do some research and reading on the history of marriage. He wanted to know about medieval ideas of marriage, particularly in the Anglo-Saxon period, pre- and post-Christianization. I provided him with some thoughts of my own, as well as some references to a few helpful resources. But I’m under no illusion that I offered these from a wholly objective position. I have clear views on this issue, and my own opinions about interpreting medieval texts, and those are certainly informed by my biases, perspectives, identities, and theories. Reflecting on these issues, I’ve come face to face with what I personally bring to my reading and interpreting. How is culture written on myself? How am I entwined with culture? What are the micro-cultures that have shaped me, that I have encountered, accepted, and rejected? I realize that I’ve been asking these hard questions for several years, through my time in graduate school, and I’m sure that I’ll continue to ask them for many more years. That seems to be the responsible thing to do. These seem, to me, to be necessary questions.